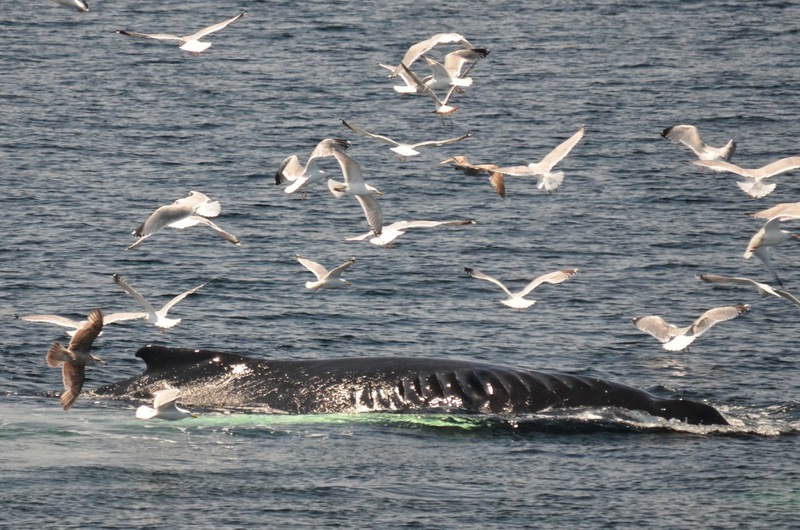 We had another fantastic whale watch on Stellwagen Bank this morning! On the western edge of midbank, there was a feeding frenzy. 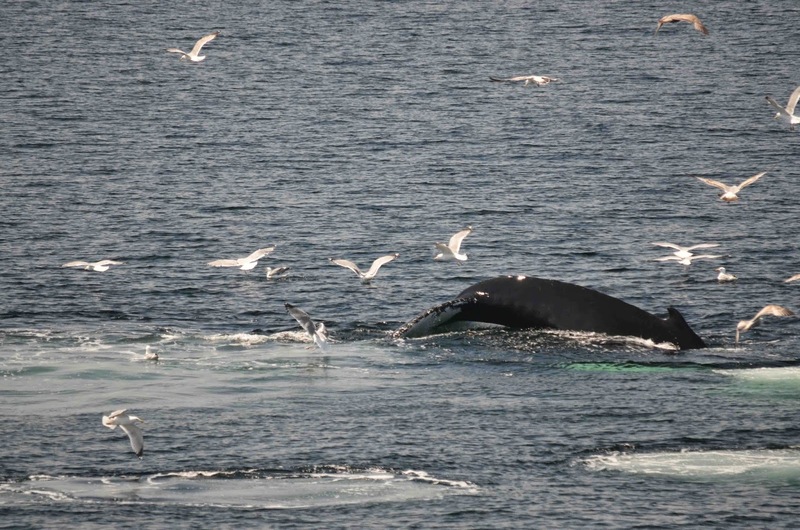 We had humpback whales, minke whales, a harbor porpoise and a fin whale all feeding in the same area. 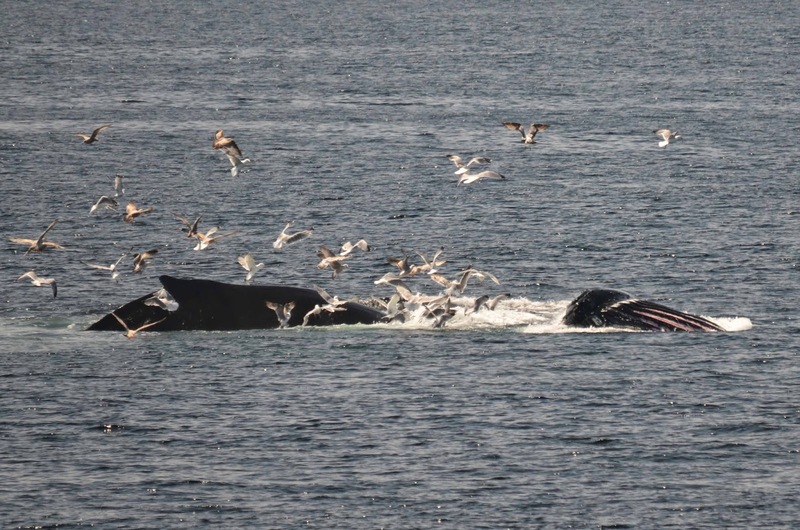 We were glad to see the many different species but were most excited to watch the three humpback whales as they feasted on small schooling fish. 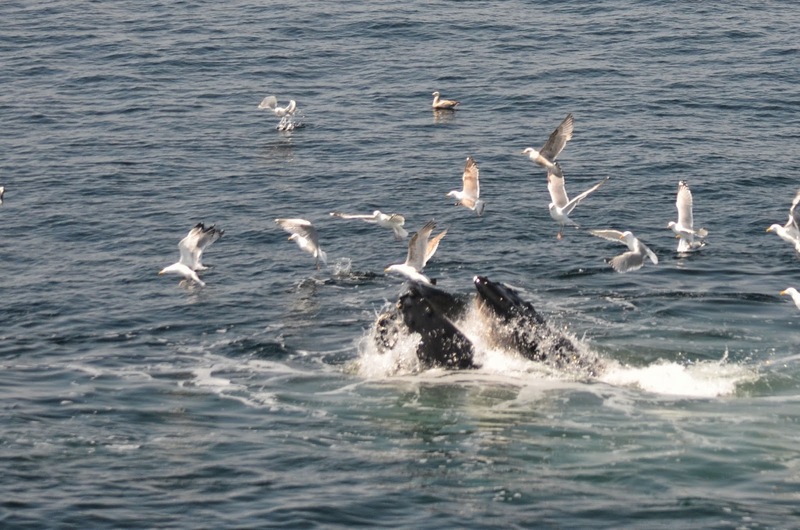 Initially, two humpback whales we identified as Amulet and Pleats worked together as they used a variety of feeding techniques to corral the fish into densely packed bait balls. The duo was using an interesting combination of kick feeding and bubble net feeding as they worked the fish and repeatedly lunged up out of the water to engulf their prey. 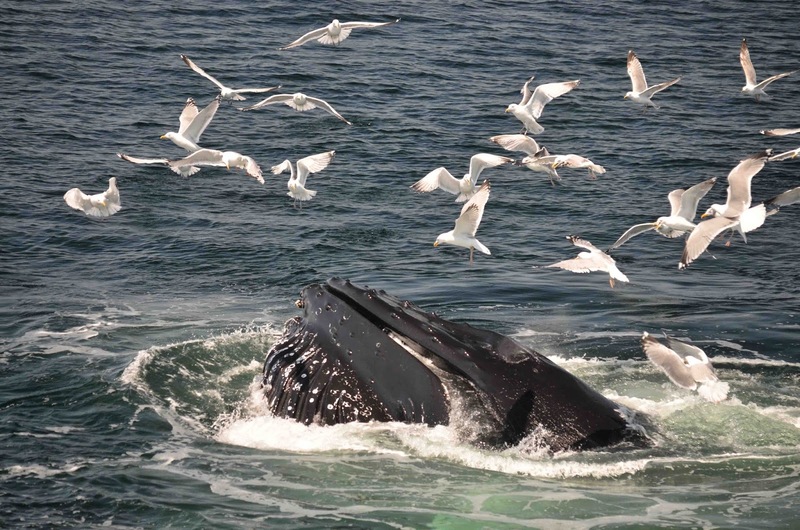 Each time the whales dove, hundreds of birds waited impatiently for the school of fish to be forced upwards by the bubbles of the whales below only to be scattered as the enormous animals breeched the surface of the ocean. 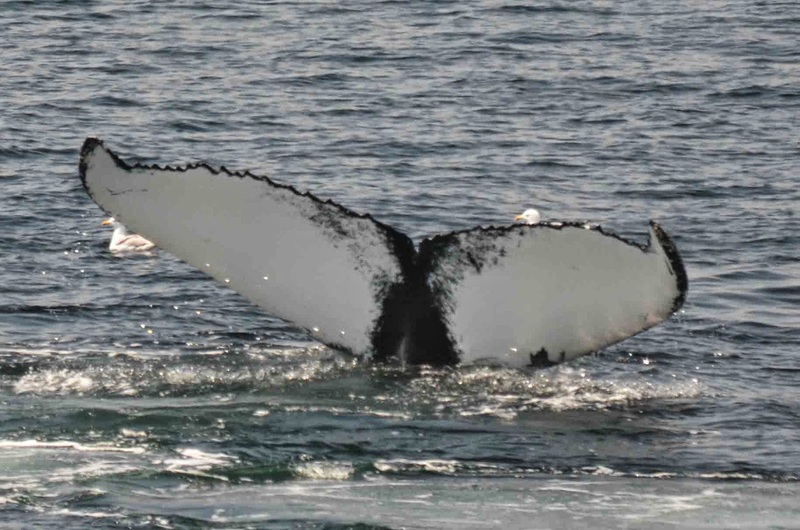 We quickly noticed that the whale we later identified as Pleats had an enormous scar that extended from just behind the whale’s blow hole, all the way past its dorsal fin. 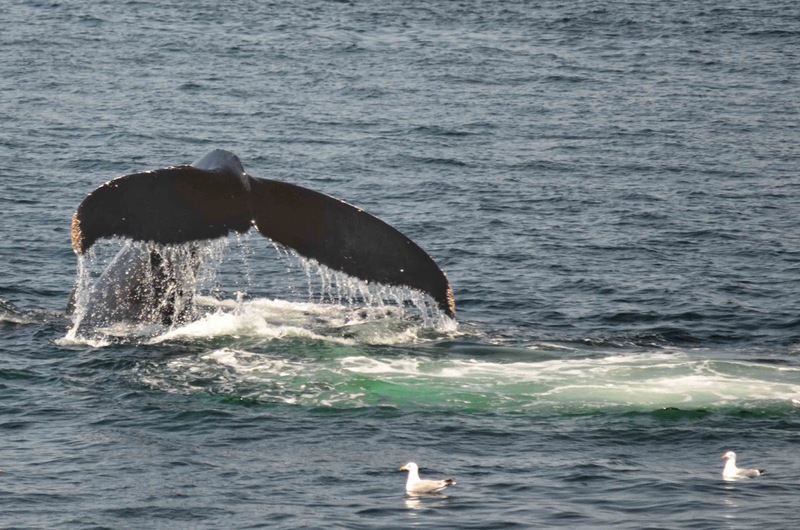 The scar consisted of dozens of parallel lines down the length of its back which is characteristic of a propeller injury from vessel strike. 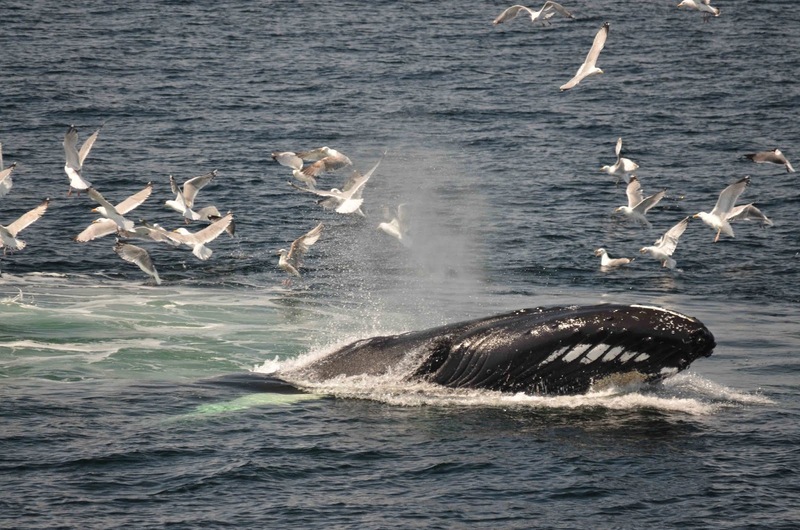 While this was a very old scar, it is astonishing that the collision with the vessel did not kill this resilient whale. We noticed that most of Pleats’ dives were very crooked and angled towards the left which made us wonder if this was a result of residual muscle damage or strictly behavioral. Either way, Pleats was actively feeding and appeared very healthy which is fantastic to see. Nearby, Pepper fed on her own in a very similar style. Soon, Amulet decided to venture on its own as Pepper made her way towards Pleats. Pepper and Pleats continued to feed together as we watched Amulet repeatedly exhibited a very rhythmic feeding technique. This technique consisted of two pumps of the fluke and a dive followed by a half circle of bubbles and an open mouth lunge. Amulet performed this feeding technique like clockwork over and over until we had to head back to Boston. It was an amazing trip and I can only hope that this sort of activity continues as we make our way through the season!